I didn't know just what was wrong with me. Till your kiss helped me name it. Now I'm no longer doubtful of what I'm living for. Cause if I make you happy I don't need no more. Oh, baby, what you've done to me. You make me feel so good inside and I just want to be close to you. You make me fell so alive. The moment I wake up. Before I put on my makeup. I say a little prayer for you. And while combing my hair now, and wondering what dress to wear now, I say a little prayer for you. Forever, forever, you'll stay in my heart and I will love you. Forever, forever, we never will part. Oh, how I love you. Together, together, that's how it must be. To live without you. Would only mean heartbreak for me. I run for the bus, dear, while riding I think of us, dear, I say a little prayer for you. At work I just take time and all through my coffee break-time, I say a little prayer for you. New Updates! (4/26/2019) We've been working really hard on completing our membership system so you can submit quotes and keep track of them. Once this is complete in the coming weeks there will be a lot more quotes by Aretha Franklin and other authors. 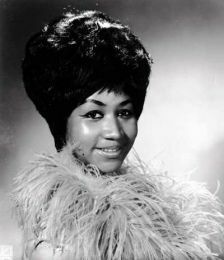 We've also changed the sorting on the site so you now see the latest Aretha Franklin quotes first. Our goal is to have the best Aretha Franklin quotes on the web!